Enjoy Morocco team organise Casablanca private tour with experienced drivers and local friendly guides. Today we will meet you in the hotel/riad and drive through the rif mountains and tetoun city to enjoy the views of the beautiful mountains till we get to Chefchaouan one of the stunning villages in the feet of Rif mountains. We explore the medina in a Spanish-style square surrounded by many funky arts and crafts stores. We spend night in local riad or hotel. After breakfast, our Tours in Morocco for 8 days continues and we will explore Roman Ruins of Volubilis. The ruins remained substantially intact until an earthquake devastated them in the mid-18th century. After you will travel on to Meknes, one of the four Imperial cities, whereyou will visit the famous El Hedim Square, the Mausoleum of Sultan Moulay Ismail before arriving to Fes. Overnight in hotel in Fes. You will enjoy a guided tour to explore bets of medina and the famous Souks of Fes and its narrow cobbled streets are filled with ancient mosques and towering green-glazed minarets. The tour will includes also a visit to the tanneries and the ceramic cooperative to see traditional Moroccan crafts. Overnight at hotel/riad. Today we departure to Ifrane (Switzerland of Morocco) and then to the Middle Atlas mountains stopping by cedar forest near Azrou, you will be able to take some fascinating photos with the Barbarian Apes, the drive continue through the Atlas Mountains enjoying the landscapes of Midelt. After lunch we’ll continue our journey through the Ziz Valley to Erfoud and Merzouga.On our arrival there will be welcomed by a cup of mint tea .Overnight at the desert riad. We explore bets of Merzouga and dunes of Erg Chebbi - we explore Khamlia, we ride the camels into the desert. 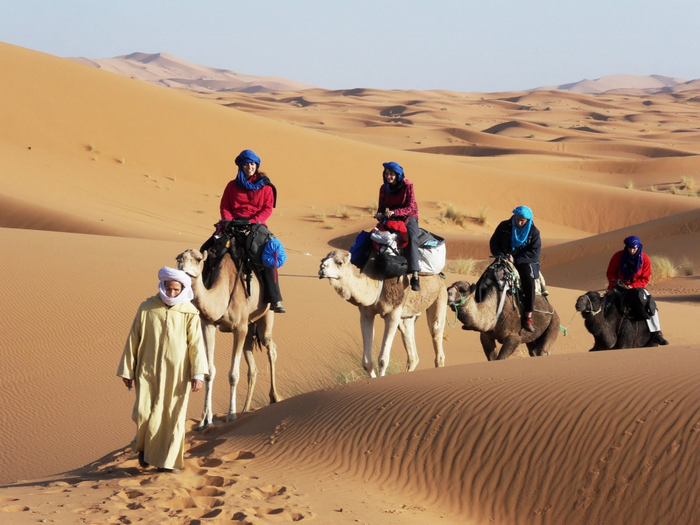 We will enjoy 1 hour camel trek to the Nomad Berber Tents with dinner. Enjoy watching desert sunset and listen Berber music at the campfire. Today you will wake up early to watch the best sunrise , and we ride camels to hotel for breakfast , the you continue to Tinghir, and we explore the stunning Todra Gorges which is the highest, narrowest gorges in Morocco. After lunch we’ll drive through the Dades Valley,where we will end our day,spending the night in a nice hotel with dinner. After breakfast we’ll drive towards Kalaat Mgouna via the “Route of 1000 Kasbahs ”. 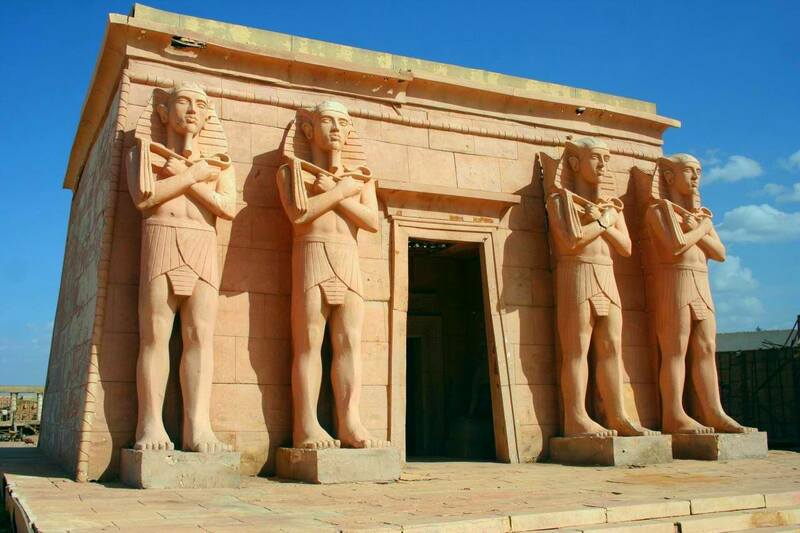 Then we’ll explore Skoura and city of Ouarzazate, called as “the Hollywood of Africa”. After lunch,we visit the famous Ait Ben Haddou kasbah,(it is the UNESCO heritage site). Here many movies have been filmed including The Mummy, Gladiator and others. Our Morocco journey continues through the High Atlas Mountains, we arrive to Marrakech, overnight in hotel. Take an exclusive private tour in Morocco from Tanger for your family, group or friends. Travel the way you want with a tailor-made itenerary. Call today! Every Tanger Tour is a 100% private Tour, contact us by email at enjoymoroccoinfo@gmail.com or Phone / WhatsApp us at +212 651-281903. Thank you.